Salt Lake City, UT – January 22, 2015 – Monnit Corporation (www.monnit.com) announced today the release of new International M2M cellular gateways for wireless sensors. In order to meet the needs of International customers, Monnit is introducing new, low-cost International Cellular Gateways. The gateways feature 3G (GSM/UMTS) or 2G (GSM/GPRS) cellular technologies allowing for operation on a majority of the world’s leading cellular networks. Monnit International Cellular Gateways are designed to support up to 100 Monnit Wireless Sensors, which are capable of detecting and monitoring functions that are critical to business operations, including; temperature, humidity, water, light, access, movement and much more. Monnit’s wireless gateways transmit data between local sensor networks and iMonnit, the online data monitoring system, which aggregates sensor information and sends notifications via text or email if user defined conditions are met or exceeded. Wireless gateways for Arduino, Raspberry Pi and BeagleBone Black. Over 20 different types of wireless sensors. FCC, IC and CE certified wireless modules. Exceptional wireless range when compared to Bluetooth and other RF types (up to 350 ft). Optimized power management provides long battery life (up to 5 years). Online community of users to share ideas and provide support. Recently Monnit made voice call notifications available in both free and Premiere iMonnit accounts. 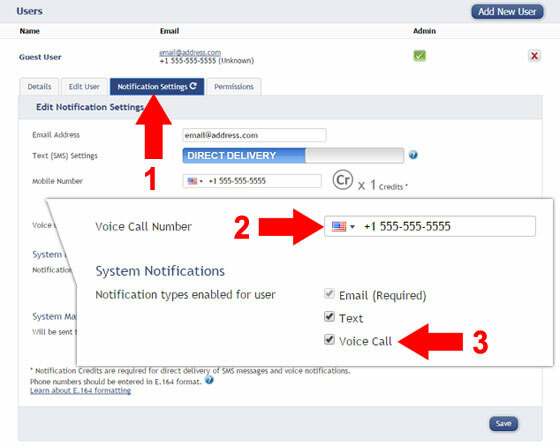 If you would like to add voice call notifications to your account, there are a few simple steps to get them working. In order to use voice call alerts you will need to purchase “notification credits” for your account. Credits can be purchased directly from your iMonnit account by going to “My Account” and clicking on “Purchase Notification Credits”. Alternately, credits can be purchased from the Monnit website under the products accessories page. If purchased from the Monnit website, you will receive a redemption code to enter into iMonnit to activate the purchased notification credits. Once you have your credits, it’s time to setup the phone number you’re going to use. Start off by going to “My Account” then select the account under “Users”. From the user information panel, select the “Notification Settings” tab (1). Enter the phone number to the “Voice Call Number” text box (2) and select your country. To use the voice call feature for notifications, check the box next to “Voice Call” (3). Now that the voice notifications are activated, it’s time to apply them to notifications. Select the “Notifications” tab from the main menu. You can create a new notification or apply voice calls to existing notifications. To apply the “Voice Call” function to an alert, select the “People to Notify” tab for that notification. For any user’s selected to receive the alert, you will now see a phone icon, click the phone to turn it on (green) or off (grey) for the selected notification and user. Boilers must maintain a certain temperature level for safe, reliable, and efficient operation. Overheating boilers may lead to damage and broken boilers decrease efficient output causing operational issues. Boiler efficiency monitoring can help improve the performance and lifespan of your boilers. Monnit’s wireless monitoring solution provides information about the performance, condition and operating efficiency of your boilers by using wireless sensors to monitor and track various aspects of boiler operation. This not only helps save operational costs such as fuel, but also provides alerts for proactive response to issues before they cause unpredicted shutdowns. In environments that demand effective and undisturbed operation, your boilers need to maintain their best possible performance. We recommend using Monnit’s affordable wireless temperature sensors to monitor and track boiler input and output temperatures. Wireless water detection sensors can help detect leaks in boilers and plumbing so you can know immediately if there is a broken pipe. Wireless pressure sensors can track output line pressure to ensure that no damage occurs to the boiler system in the event of overheating. There are no wires to worry about, and the setup process is amazingly simple. Temperature Sensors Monitor input and output temperatures of boilers. Water Detection Sensors Detect the immediate presence of water leaks. Pressure Sensors Monitor and track output pressure of boilers. 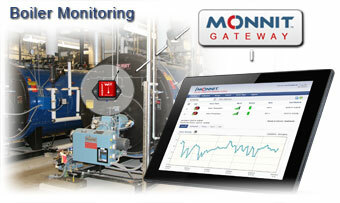 Ensure your boilers are running efficiently with Monnit wireless monitoring solutions.